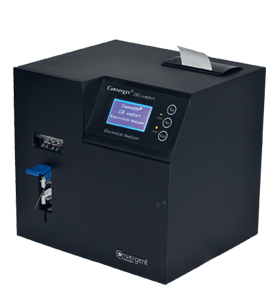 The Convergys® ISE comfort Electrolyte Analyzer is based on the advanced ion selective electrode (ISE) technology. It measures K+, Na+, Cl– , Ca++, Li+ and pH concentrations in whole Blood, Serum, Plasma, Urine or CSF. The Analyzer is designed, developed and manufactured in Germany according to the requirements and characteristics of international market. It has a very compact design and the only interface is an extremely user friendly LCD panel with a keypad with three soft keys for simple use. The sample aspiration probe is located under a blue cover panel which is used to operate the probe. The Analyzer can store up to 250 tests and 31 tests for each of the 2 QC levels.